Question: What is meant by the term low vision? Dr. Eckard: Low vision is when a patient’s vision is not correctable with traditional glasses or contact lenses to usually 20/40 or better. Most low vision patients have vision much worse than this though. Often this is from conditions such as corneal scarring, macular degeneration, glaucoma and other conditions affecting the retina and/or optic nerve. Question: What are the causes of low vision? Dr. Eckard: Macular degeneration, diabetic retinopathy, corneal or retinal scarring, glaucoma, optic neuropathies etc. are some of the most common causes for this type of reduced vision. Question: Who is at greater risk for low vision? Question: Is low vision just a function of getting older? Dr. Eckard: No. Many people have corneal and retinal scarring from previous trauma, surgeries or congenital conditions that aren’t aging related. 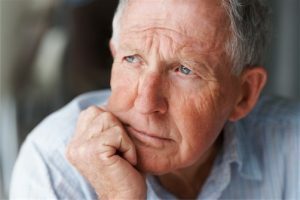 However, many of the conditions mentioned that cause low vision happen more frequently in older patients. Question: How does low vision impact peoples’ lives? Dr. Eckard: It can make daily living skills such as driving, reading, recognizing faces, eating and grooming more difficult with reduced vision. Question: What options are available today for a person with low vision? Dr. Eckard: There are low vision products for distance vision and sometimes driving such as optical telescopes that work with special glasses. There are hand-held lighted magnifiers and CCTV’s for enhanced near vision. Many devices are portable and can be used outside of the home and others are larger more stationary for in home use. Question: What resources and strategies can help people perform daily tasks at home? Dr. Eckard: Often times, low vision therapists perform in office and in-home training to help the patient with low vision better adapt to daily living tasks depending on their specific visual needs. Low vision therapists also work to train patients in the proper use of their low vision devices. In some areas there are local or state agencies that provide low vision assistance to patients.